Happy Monday, everyone! How was your weekend? We have Drake this week so our weekend was filled with karate class, entertaining and our first week at our new church with little man. We are back at our "mega church" from what people say so his Sunday School is basically like an amusement park and it was all so foreign to me getting him registered and ready to go but I had a moment of serious pregnancy embarrassment taking him yesterday. His classroom is up on the second level of the building leaving me walking a few flights of stairs outside to sign him in. Well, add heels, a pregnant chick and 110 degree heat with stairs.... it's not pretty. It took me far too long to make my way up to sign him in and I was a heaving, sweaty mess when I reached the top. Conclusion: Andrew will be doing the drop off // pick up thing from now on, solo. 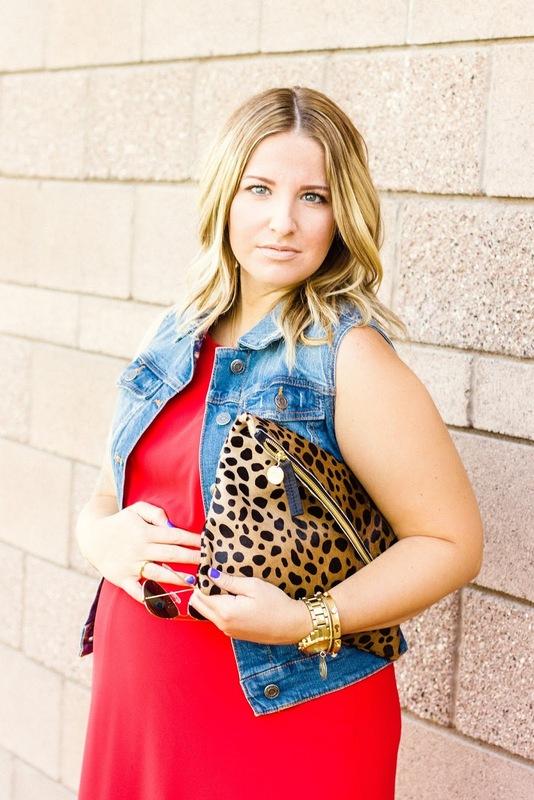 On to this outfit... are you so sick of seeing this leopard clutch everywhere? I hope not! I am obsessed and it will still be making it's appearance quite often throughout outfit posts... just saying so brace yourself! I was finally able to pick up a few items from my tailor this last week including this Kiki La'Rue maxi dress and I was elated how it came out. 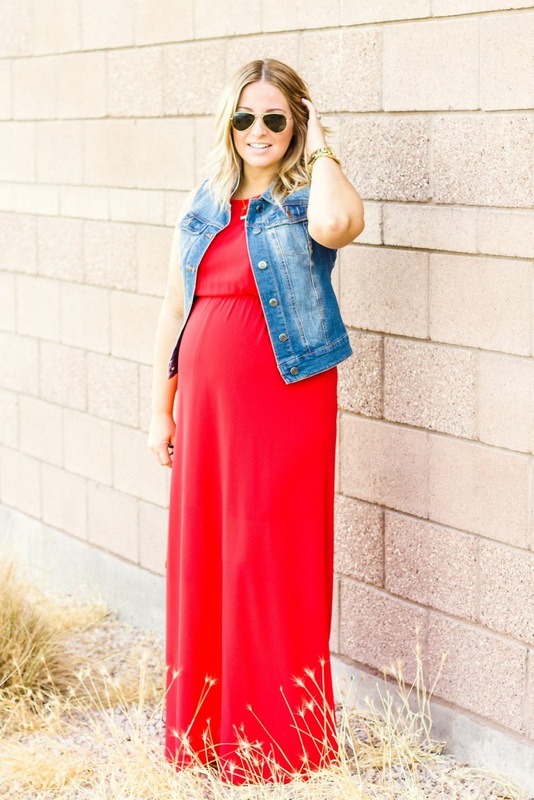 Being 5 foot it's hard to find a maxi that doesn't need some altering so having it back in my closet has been glorious! I've already worn it twice in one week... (shhhh, don't judge) and I plan to wear it again this weekend because it's so airy and cool for summer! A total win, my friends. I love the outfit. I was thinking of an outfit like this for me too. You look so beautiful!! And I love the clutch-can't wait to see more of it. You look fabulous! Very natural hair and makeup...love it! Red HOTT, love it! Also, I'm not even pregnant and I can't imagine walking flights of stairs in heels..in the heat. The humidity here this weekend nearly did me in! Red HOTT, love it! Also, I'm not even pregnant and I can't imagine walking flights of stairs in heels...in the heat. The humidity here this weekend nearly did me in! You look so gorge in that dress! Love it! What a gorgeous Mama!!! Red hot, for sure! You look gorgeous! I love this dress! The color is awesome on you! Love this dress!! You look great! I haven't caught up on your posts for a while and I just got lost on your blog for a good half hour. You look beautiful. Congrats on that wonderful baby girl!